It’s still cold as I write this (at least ten degrees below ‘normal’). I went out with the 75-pound puppy and played catch (actually it’s more like keep-away since once he gets the ball, he spends most of the time teasing me with it), and watched the sun try to melt the frost off everything in sight. Dafs were bowed down as were the Peter Stuyvesant hyacinths, and there was a skim of ice over all of the birdbaths. By this time last year I had a bunch of stuff growing in the garden – beneath row cover to be sure, but thriving. The rhubarb was up, and I was making rhubarb crisp (with grated orange rind and oatmeal-and-pecan crumble topping), and I had cleared off most of the detritus that more assiduous gardeners would have taken down the previous fall. This year, all I’ve got is chickweed and henbit and new shoots from last year’s wiregrass. Then I went into the greenhouse and felt like I’d stepped into the spring that we should be having. It’s warm and fragrant with the volunteer petunias my husband accidentally included when he used compost to pot up a sprouted avocado seed. 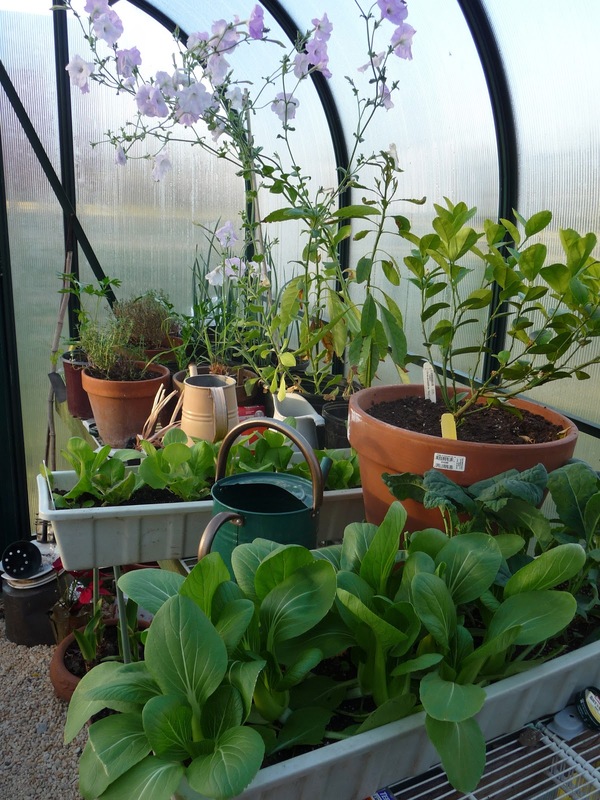 But while the greenhouse, my little bit of heaven, looks much more hopeful, not it’s not without its frustrations. It’s always something. 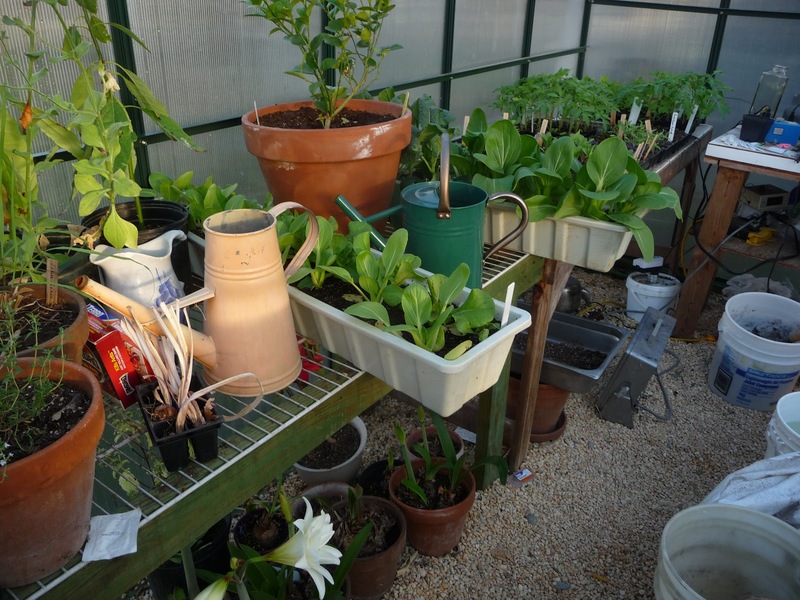 With the slow spring, the things I had thought would be shifted outside by now are still in there along with a lot of the seedlings that are getting bigger and demanding more space all the time. 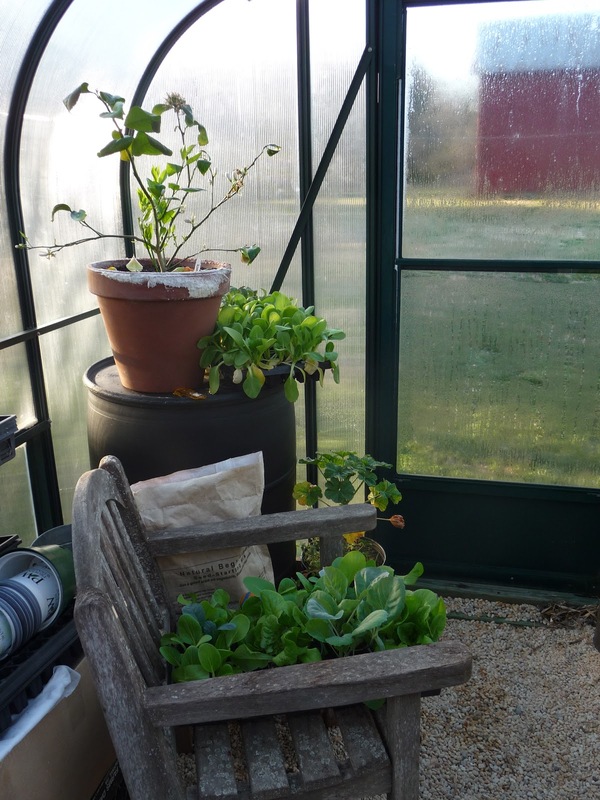 The 55-gallon drum that I painted black and fill each fall with water to act as a passive solar heater is still taking up space in one corner, and now sports one of the Meyer lemon trees and a mixed flat of arugula and pak choi on its lid. The potted leeks (another experiment) are stuffed into a corner beside three pots of French thyme, two of parsley, a couple of avocado plants, and a Key lime to say nothing of the two long experimental containers of pak choi and lacinato kale. Farther along the flats of tomato, basil, pepper, and more sit on heat mats, while the second Meyer lemon and an ailing bay plant given me years ago by a friend are crammed into the northeast corner. Overpopulation is not healthy. The crowd has helped to foster not only an infestation of white fly, which I had been battling in the Meyer lemon trees with insecticidal soap (and only a modicum of success), but two days ago when I was bringing the flats of pak choi and arugula outside for hardening off, I discovered a burgeoning infestation of aphids and not a ladybug in sight. I hit them with insecticidal soap. At the moment it looks like it’s solved, though that could change. Life turns on a dime. Some of the kale and pak choi are within a couple of days of being harvested for stir fry, so I’m right now hunting up my reading glasses so I can figure out how long I need to wait after spraying before I can safely wash and eat the stuff I’ve been babying and hovering over like a helicopter parent for weeks.The weatherman promises that April will ACTUALLY get here this weekend, which is when I hope to get some of that crowded greenery planted. Let the games begin! I'm in the same boat. It was 29 in clarksville last night and while my peas, favas, and potatoes are in the ground, they show no signs of growth. I also have two cold frames loaded with 16 flats of cool season vegetables which need to be planted. It has certainly been a cool spring. The month of March was 3 degree days cooler than our normal March. Hopefully, temperatures will start to moderate. I'm still battling the aphids on my seedlings – have tried soapy water, rather ancient pyrethrum spray, and finally washing each seedling individually under running water, and there are still aphids, which I know I can't trap under row cover when I finally manage to put what greens seedlings are left into the ground (hopefully next week). I hope yours stay away! I've never had this problem before and it's not fun at all. We do just have to take what comes with the weather, but these last two springs have been complete opposites, which is a challenge! I've not dealt with aphids in the greenhouse before, at least that I can remember, but the insecticidal soap seems to be working just fine. The white fly is not so much altered, tho. what seems to work best for them is to take the plant out of the greenhouse, spray it with the nozzle set to 'jet' (and watch the most-affecte leaves fall off in a blast of water) and then return it clean and shining back to the greenhouse, tho I have not taken it out in the past few weeks since it has blossoms and tiny fruits that will be demolished if I do. 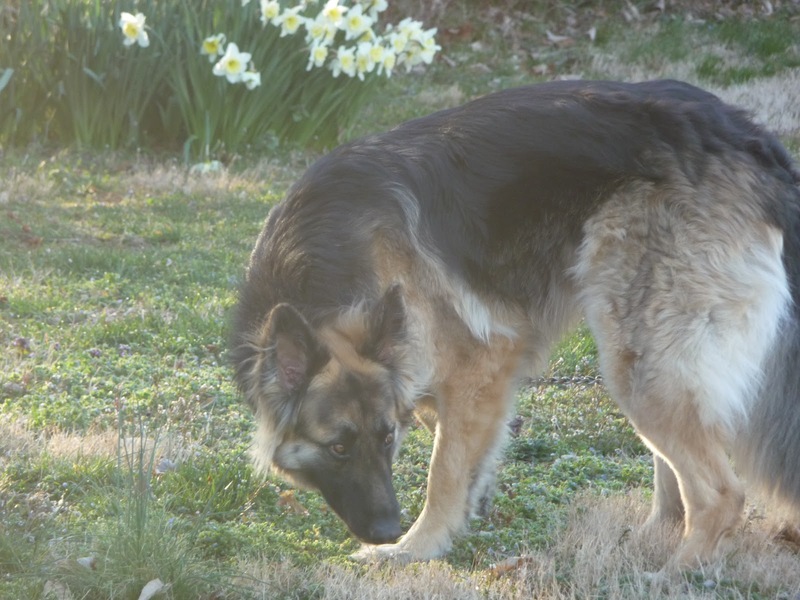 Right now, tho, they're outside on the grass and I will soon go hose them all — lovingly of course.